It was a lazy Sunday. I got some chicken pieces for a curry and some boneless chicken for trying out a new recipe. My husband insisted that he would prepare a chicken curry, with my help of course. So by the time we finished curry, parathas, rice and salad, my boneless chicken laid there, waiting for me =) It was almost time for supper and I didn’t know what to do with it. Since it had thawed I didn’t want to put it into the freezer. While still thinking about what to do, I marinated it with sea salt, pepper and garlic. And the rest is for you to read below. But it turned out really good! Quick and simple. Sea salt (rock salt or use plain salt) and pepper to taste. Marinate the chicken with sea salt, pepper and garlic until you make the batter. In a mixing bowl, combine all the ingredients of the batter and beat well. Then add the chicken pieces into the batter and mix them to coat properly. Set it aside for 15-20 minutes. Then heat oil in a wok (for deep frying) or pan (for shallow frying). 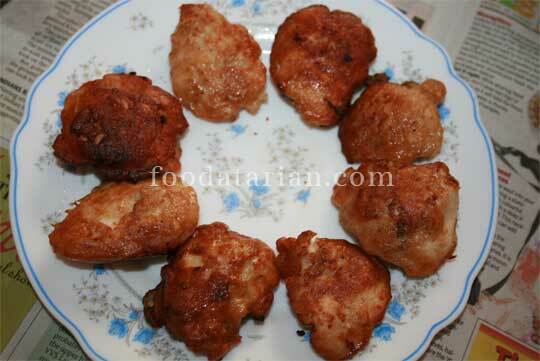 Fry the chicken bits on low-medium flame until they are cooked and get a reddish color all over. Serve hot fritters with ketchup.